Five Shadows » Blog Archive » One Monthly Goal – November Finish! One Monthly Goal – November Finish! On this last day of November, 2017 I completed my November goal of piecing & trimming the alternate units for Chic Country. Phew! … and Happy Dance! 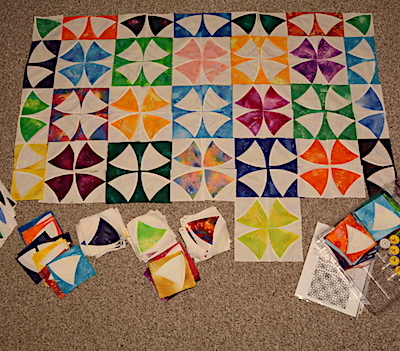 I couldn’t resist laying out some of the units to see the how the quilt top will come together! I must say, I am happy! I hosted my quilting group today. It was nice to have the gals here to chat with while finishing the last of the units. I’ll be putting this project away until January. Linking to One Monthly Goal with Patty at Elm Street Quilts. Go check out what the other participants have been working on this month! And then join in for December! This entry was posted on Thursday, November 30th, 2017 at 20:38	and is filed under Quilting. You can follow any responses to this entry through the RSS 2.0 feed. You can skip to the end and leave a response. Pinging is currently not allowed. The blocks are fabulous, the colours and the design perfect. I just love these blocks. Are they made from a template? Thanks for linking up with Elm Street Quilts One Monthly Goal and congrats on your finish.